In this project we are going to build an Android Phone controlled robot using 8051 microcontrollers and Bluetooth module. The robot is designed using DC motors and the direction of DC motors will be controlled by the commands received from the android application. The status of the robot is sent back to the Android app. This project will also help for interfacing of HC-05 Bluetooth module with 8051 microcontrollers. We already used Bluetooth module to control home appliances with 8051. 8051 microcontroller is a 8-bit microcontroller which has 128 bytes of on chip RAM, 4K bytes of on chip ROM, two timers, one serial port and four 8bit ports. 8052 microcontroller is an extension of 8051 microcontroller. In this project we are using AT89S52 microcontroller. The table below shows the comparison of 8051 family members. Default baud rate: 9600bps , 8 data bits , 1 stop bit , no parity. Vcc and Gnd pins are used for powering the HC-05. Tx and Rx pins are used for communicating with the microcontroller. State pin acts status indicator. When it is not paired/connected with any other Bluetooth device, LED flashes continuously. When it is connected/paired with any other Bluetooth device, then the LED flashes with the constant delay of 2 seconds. L293D is a dual H-bridge motor driver IC. This acts as a current amplifier, the output of L293D drives the DC Motors. It contains two inbuilt H-bridge circuits. In common mode of operation , it can drive two dc motors simultaneously in both the directions. The below table shows the pin description of L293D IC. 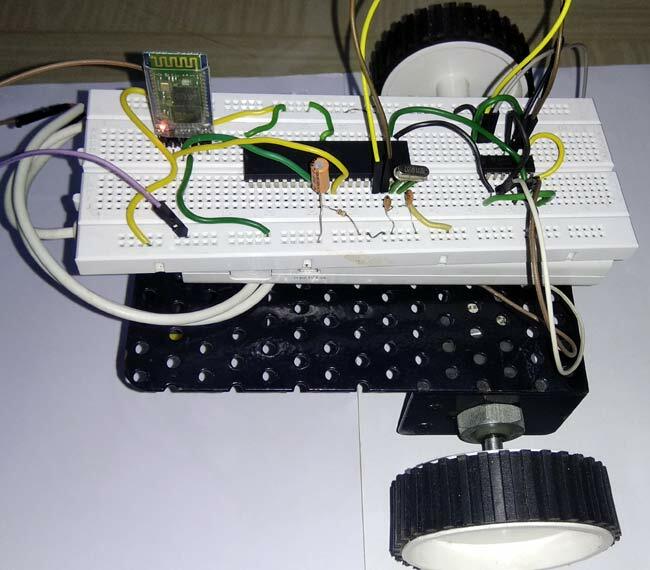 Here are some projects using L293D Motor Driver. In this Smart Phone controlled Robot, the user of android app sends the data to 8051 microcontroller through HC-05 module. The received data is compared in 8051 microcontroller and the decision is made accordingly. The below table shows the direction of motors and status of robot for different received characters. The Bluetooth terminal app allows us to emulate a Bluetooth terminal. This app supports bidirectional communication and this app is compatible with most of the devices. The steps below show how to install and use this app. 1. Download and install Bluetooth terminal app on your android phone. The app can be downloaded from the below link. 2. After installing the app, open the app and turn on Bluetooth. 3. Select the device and click on connect option. After successful connection, we can start sending data to HC-05 module. Check the Code Explanation below to see how the character is sent and received by 8051 Microcontroller to rotate the required motors. The complete C program and demonstration Video for this project is given at the end of this project. The code is split into small meaningful chunks and explained below. Next we have to define some functions which are used in the program. Delay function is used to create specified time delay. Txdata function is used to transmit data through serial port . Rxdata function is used to receive data from serial port. In this part of the code we are going to configure 8051 microcontroller for serial communication. TMOD register is loaded with 0x20 for timer 1, mode 2 (auto reload). SCON register is loaded with 0x50 for 8 data bits, 1 stop bit and receive enabled. TH1 register is loaded with 0xfd for baud rate of 9600 bits per second. TR1=1 is used to start the timer. In this part of the code, the returned character of rxdata function is stored in the variable ‘s’ for further use. In this part of the code, we have to compare the received character with preassigned characters for different directions. If the received character is ‘f ‘, then the robot has to move in forward direction. This is accomplished by making m1f, m2f pins high and m1b, m2b pins low. Once this is done, next we have to send status of robot to android app. This is done with the help of txdata function. The same process is repeated for different characters received and decision is taken accordingly. Table 1 shows different values of m1f, m1b, m2f, m2b for different directions of movement of robot. This is you can rotate the Robot car in any direction by controlling the four motors using 8051 microcontroller. This robot can also be controlled using DTMF with 8051, if you don’t have android phone. Also check all the Robotics Projects here. return ch1; //return the received data to main function. I have another robot car built on Raspberry and it needs a power source so I use a portable battery bank to power everything including the wheels. What have you used to power the wheels it is not clear to me how everything is powered. Did you use a portable power bank as well? Yes , I have used a power bank . the supplu provided as vcc(5v) is not reaching the motors. what should i do? I just wanted to know why did you wrote a delay between every motor instruction? u can also do it without delay. The Bluetooth module shown here is only for circuit diagram, it will not work in simulation.